The Damascus Opera House (officially Dar al-Assad for Culture and Arts) (Arabic: دار الأسد للثقافة و الفنون‎) is the national opera house of Syria. 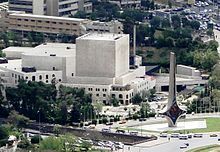 Inaugurated on 7 May 2004, it is located in central Damascus, on the Umayyad Square. Damascus already had an opera house from the 1900s. During the French colonial period Shahbandar's People's Party held their inaugural meeting at the old Damascus Opera House in 1925. Hafez al-Assad planned the opera house early in his rule, but work did not recommence until the 2000s and Assad's son Bashar and his wife, opened Al Assad opera house in 2004. The opera house is a five-level building that includes an opera theatre, a drama theatre and a multipurpose hall. Aside from visiting foreign artists, the company produced The Marriage of Figaro in 2010. The current (2011) director of the House and Company is Maria Arnaout, producer of Gianni Schicchi, An international Oriental Music Festival and a Syrian version of the musical Oliver! casting orphans after the model of El Sistema's work with street children in Venezuela. So far the opera house has not included in its programmes opera in Arabic or art song in Arabic. ^ Fawwāz, Layla Tarazī; al-K̲ālidī, Walīd; Manṣūr, Kamīl (2009). Transformed Landscapes – Essays on Palestine and the Middle East in Honor of Walid Khalidi. Cairo; New York City: American University in Cairo Press. p. 37. ISBN 978-9-774-16247-3."... Party inauguration on 5 June 1925, more than a thousand people crowded into Damascus Opera House to hear their leaders express freely and legally, for the first time since the Syrian Congress of 1920, the will of the Syrian people"
^ [dead link] Syria Today. Syria Today. This page was last edited on 21 April 2019, at 17:20 (UTC).